This Reference Article defines and explains the topic of control variables within CODESOFT and SENTINEL applications. Both applications use control variables but how they are used depends on which application is using them. Control variables are used by CODESOFT and SENTINEL to either pull specific data embedded within a label (e.g. author, label name, label path, approval status) or to control the printing process (e.g. label quantity, printer name, etc.). @appoved – indicates if the label is marked ‘approved’; 1 – label is approved, 0 – label is not approved. @comments – This variable corresponds to the comments defined in the label properties. @intercut – The field containing this variable determines the number of labels to be printed between each cut. It must be numeric. @labelcpy – The field that contains this variable determines the number of identical labels to be printed between counter increments (if the label contains any). It must be numeric. In the case of a print merge, this quantity can be fixed (value determined when printing is launched) or variable, using @LABELCPY. Note: This variable corresponds to the number of identical labels to be printed, defined in the General tab in the Print dialog box. @labelperrow – Thus variable corresponds to the number of rows on a page. @labelpercolumn – This variable corresponds to the number of columns defined on a page. @labname – The field that contains this variable determines the document name that must be changed during an import operation. The fields imported from documents used in the merge must be compatible with those of the data file.The @LABNAME variable is no longer interpreted by the software. You must use the Database Manager. Note: The specified document’s name must only include the file name, excluding the complete path (for example: Identity.lab). @labpath – This variable corresponds to the document’s complete path (for example: C:\Documents and Settings\User\My Documents\). @mlocurpage – Current page of the ListField. @mlomaxqty – Total number of pages to display the Listfield content. @pagecpy – Total number of pages to display the Listfield content. @portname – This control variable can only be used as an input value in a formula. It contains the name of the port for the selected printer. 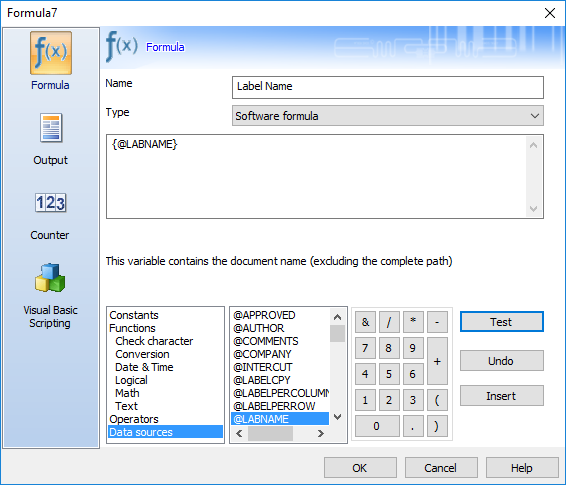 @printername – This control variable can only be used as an input value in a formula. It contains the name of the selected printer. @progname -This variable corresponds to the program name. @serialqty – The field that contains this variable determines the number of labels to be printed. It must be numeric.During a merge, the file is read in sequence from beginning to end. Each record causes one or more labels to be printed. The number of labels printed for each record can be fixed (determined when printing is launched) or variable, using @SERIALQTY. In this case, the content of the field this variable is attributed to in the data file determines the quantity to be printed. @title – This variable corresponds to the title defined in the label properties. @username – This variable corresponds to the name of the program user. All numeric values (including negative or decimal numbers) are considered valid (so they are evaluated as 1). Also, the text values starting with a number are considered valid: it keeps the left numerical part and ignores the rest. @printer_name – printer name (or alias) to where SENTINEL should send print job. @default_printer – Contains the name of the default printer to be used when the @PRINTER_NAME variable is empty. @label_name – label design name SENTINEL should use use for the print job. @default_Label – Contains the name of the default document to be used when the @LABEL_NAME variable is empty. @label_quantity – quantity of labels for SENTINEL to print. If the label design includes label specific variables such as a counter (e.g. for a serial number) and/or date and time, the counter will increment for each label and the date/time stamp will be updated for each label. @default_quantity – Contains the default number of labels to be printed when the @LABEL_QUANTITY variable is empty. @label_copy – Determines the number of labels to be duplicated. @intercut – determines the number of labels to be printed between each cut. @page_copy – determines the number of page copies to be printed. @query – the task name to use with the Database plug-in. @webmethod – the function name to use with the Web Service plug-in. @watermark – defines the contents of a watermark to be superimposed on top of the label to be printed by SENTINEL. See related article on the @watermark function for SENTINEL below. @job_map – contains the name of the maps to use for analyzing the workfile. @job_copy – duplicates labels in an “assembled” print series. 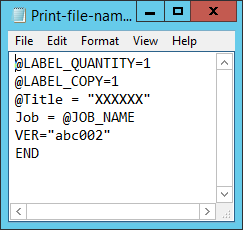 For example, @JOB_COPY = 2 for printing labels A, B and C gives A, B, C, A, B, C. Using the @LABELCPY variable would have given A, A, B, B, C, C.
@job_data – contains the data for analysis. @PROP_Printable – Indicates if the object will be printed or not. The value can be 0 (Not Printable) or 1 (Printable). @PROP_Rotation – Sets the rotation of the object. The value can be one of the following: 0, 900, 1800, 2700. @PROP_BackColor – Sets the background color of the object. @PROP_ForeColor – Sets the foreground color of the object. @PROP_Width – Sets the width of the object (in millimeter x 100 or inch x 100 depending on the designers configuration). @PROP_Height – Sets the height of the object (in millimeter x 100 or inch x 100 depending on the designers configuration). @PROP_Top – Sets the distance between the top edge of the anchor point of the object and the top edge of the document (in millimeter x 100 or inch x 100 depending on the designers configuration). @PROP_Left – Sets the distance between the left edge of the anchor point of the object and the left edge of the document (in millimeter x 100 or inch x 100 depending on the designers configuration). @PROP_MarginLeft – Sets the internal left margin of the object. @PROP_MarginRight – Sets the internal right margin of the object. @PROP_MarginTop – Sets the internal top margin of the object. @PROP_MarginBottom Sets the internal bottom margin of the object. @PROP_ AnchorPoint – Sets the anchor point of the object. The image below shows the use of a control variable (@LABNAME) in a formula for a label. Use of this Data Source for a field on the label will print the label name on the label itself.